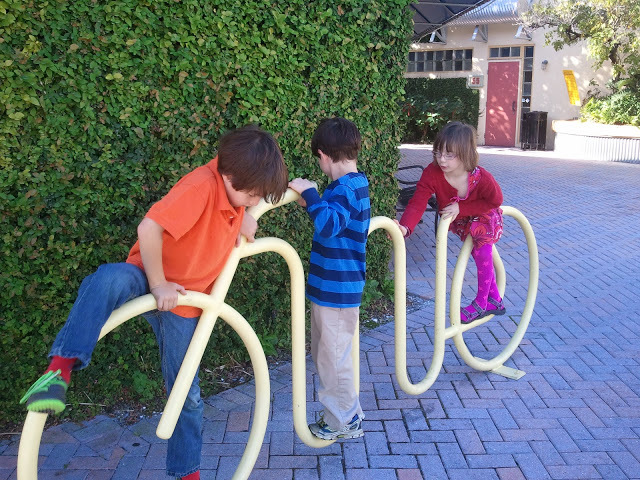 Energetic children will make a play structure out of anything, of course, but the presence of items like this make for a more engaging environment... This happened to take place on a Friday morning before the crowds were up and out. 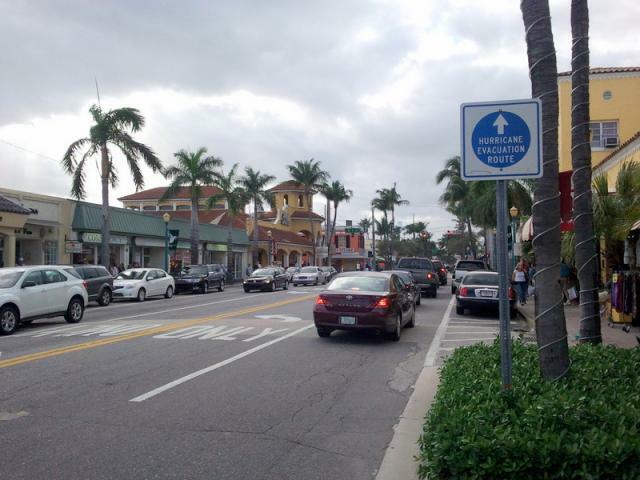 The city has certainly put effort into maintaining a vibrant and safe pedestrian culture in downtown Delray Beach, but they have also clearly put effort into making sure it is a FUN pedestrian culture as well. Throughout the downtown are scattered tink pocket parks, courtyards, public art, and amenities: trees to climb, playground equipment, whimsical bike racks, excellent signage, streetside dining, well-manicured plantings, interesting pavement, murals, lights. What is really neat about it all is that except for a substantial "public square" area, there is not a feeling of being "planned". Much of this investment in pedestrian amenity is private and individual - not a massive public investment, but the long-term development and promotion of a pedestrian culture. 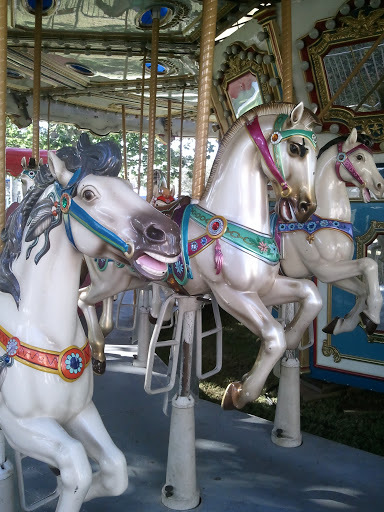 Carousel: Carousel in downtown Delray Beach, FL. 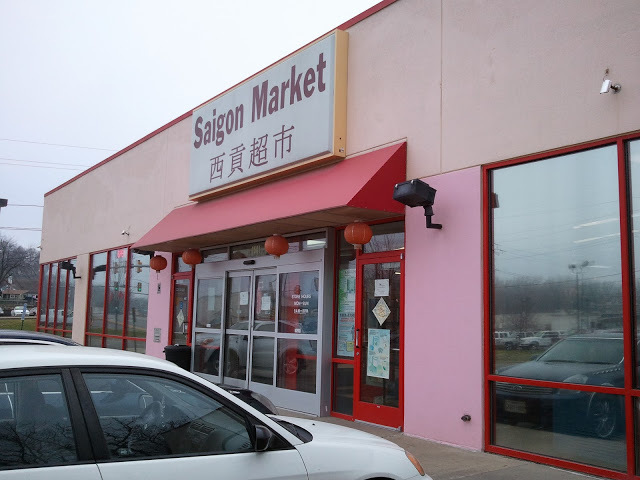 And on a completely different note, I finally got around to shopping at Saigon Market (MLK and Douglas) this past weekend. There are certain things it only makes sense to purchase at an Asian market. Among them: rice, coconut milk, nori, rice sticks, basil, fish sauce, curry paste, limes, green onions, bok choi... My full grocery bag cost $12.71. For kicks, I priced out the same items at HyVee when I had to stop there later in the day and ended up at about $18. Of them, the coconut milk was particularly noteworthy at more than twice the price at HyVee. Plus, the benefits of supporting local small business. There is another Asian market I particularly like - located downtown on Grand, the New Oriental Food Store is situated just down the street from the State Historical Society building, where I find myself relatively often. Huge sacks of rice stand sentry in its storefront window (the big blank facade above is concerning from an urban planning perspective, and I'm curious what sort of business goes on up above the store). I try to stop in for some staples as I am driving by. Both of these stores are worth a short trip as you are grocery shopping.